When Hurricane Katrina roared ashore in Louisiana 11 years ago, the Bennett family in Pearl River was among many who lost their home to the storm. And, like many other families along the Gulf Coast, Timothy and Danielle Bennett and their children are still feeling the effects, having spent the past 10 years living in a FEMA trailer. This week, however, a new Fuller Center home is being constructed on the very property where logger Timothy Bennett was raised thanks to the Ginger Ford Northshore Fuller Center, a local group calling itself Compassion Pearl River and a whole lot of kind-hearted mission workers from Salem Reformed Church of Little Rock, Iowa, who are spending a week in the Louisiana heat and humidity helping the Bennetts have a simple, decent place to live. The seeds for this rapidly moving project, though, were planted about four years ago with a little Mother’s Day video. Travis Bennett, now 17, was attending First Baptist Church of Pearl River by himself at the time. When he participated in the church’s filming of a little video called “My Mommy Is the Best Mommy in the World Because …,” life for the Bennetts would begin to change for the better. Shortly afterward, Pitman went to visit the Bennetts at their home. Pitman rallied his church behind the mission and helped lead the formation of Compassion Pearl Group, an unofficial group now united around the cause of helping local families in need. What he needed to help the Bennetts was someone who knew how to lead a charitable house building effort. He could not find such a nonprofit in St. Tammany Parish, but he did find one in neighboring Tangipahoa Parish — home of the Ginger Ford Northshore Fuller Center for Housing, led by Executive Director Tamara Danel. 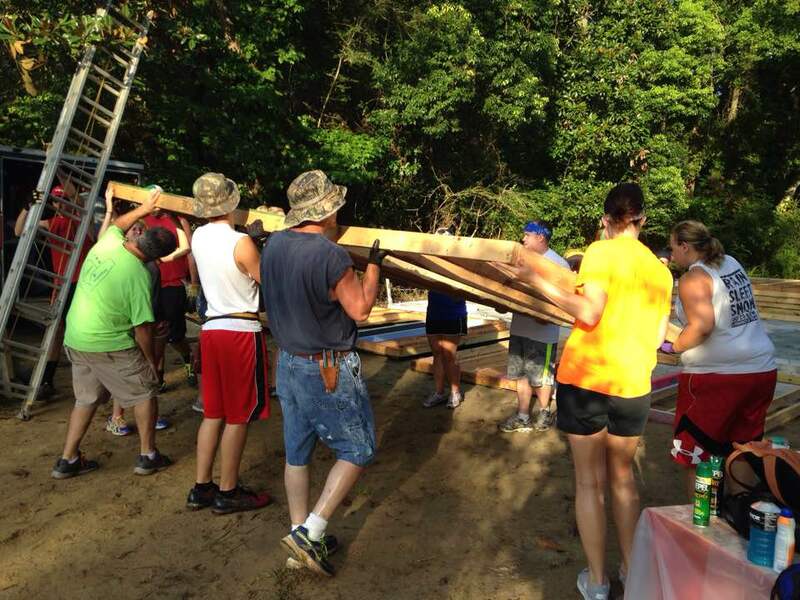 Volunteers raise the first wall of the Bennett home on Monday. While Danel was pleased to hear that First Baptist and the local Pearl River community were ready to help fund the home build, the city was well out of Ginger Ford Northshore’s normal service area. 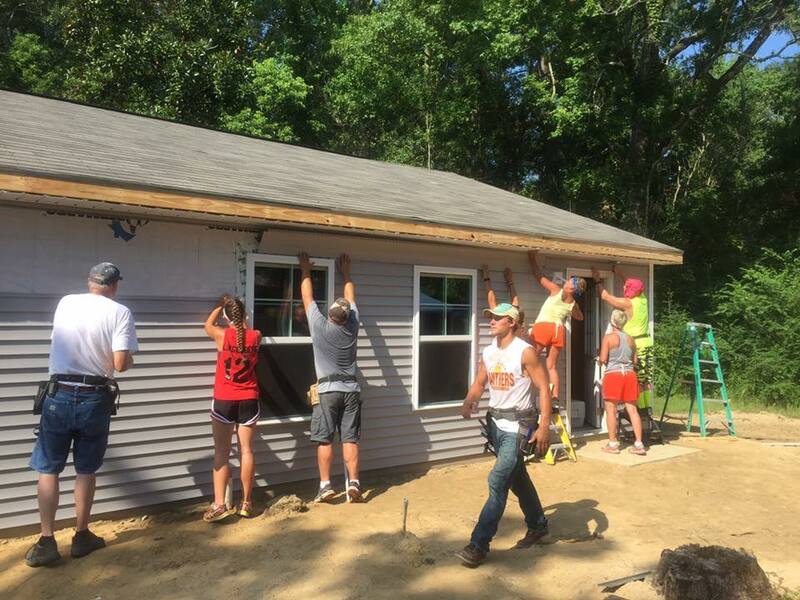 Organizing volunteers for a faraway build might have been too daunting a task — until someone from Salem Reformed Church in Little Rock, Iowa, called Fuller Center for Housing headquarters in Americus, Ga., asking if there were any service opportunities for a group of nearly 50 people. Director of U.S. Covenant Partner Development Stacey Odom-Driggers immediately contacted Danel to let her know finding volunteers for this project was not going to be a problem. Ginger Ford Northshore is used to new home builds that take a few months, but Salem Reformed Church has hit the ground running this week. After years of waiting for a home, Danielle Bennett also is impressed by seeing the project progress from slab to a fully shaped home in one week. 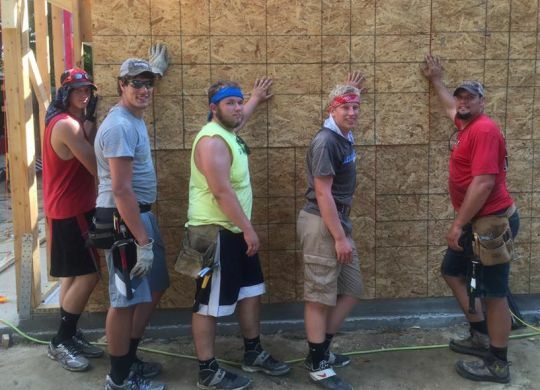 Schilling said the church’s first home building mission was nine years ago in Montana, followed by builds six years ago and three years ago in Texas. While it changes the lives of families like the Bennetts, it also strengthens Salem Reformed’s church family. “When you go to a church of 300 members or whatever, you know a select group of the church,” Schilling said. “You know of them, know their families, talk to them on Sundays. But you don’t really get to know them, you don’t get to really be personal with them as much as you’d like. This trip really grows our church together. Danel said she is impressed by how “mission-minded” the visiting church members are, but just as striking is the fellowship and joy they show even as they fight through the southeastern Louisiana heat and humidity. Schilling confirmed Danel’s impression of the church as mission-minded. Volunteers work Thursday on siding. What’s next for the Pearl River community? Kathryn Walsh, who has been a member of Pearl River’s Board of Aldermen for more than five years, is getting a crash course in The Fuller Center for Housing’s principles of offering a hand-up in partnership to families in need instead of a handout. She is impressed with how The Fuller Center requires families to perform sweat equity and how families are able to pay it forward by making zero-interest, no-profit-made mortgage payments into a fund to help other families in the area get the same kind of hand-up. Walsh hopes that this project serves as a springboard for similar empowerment projects in the community. The community’s excitement has been noticed by the visitors from Iowa, as well. Pitman is proud that his church has embraced the project for the Bennett family but insists that the Compassion Pearl River effort is more of a community-wide ministry than one church’s project as many different people from several different churches have been involved. While there are high hopes for future such projects, there is nothing quite like the present joy now on display in Pearl River. MORE: Listen to The Fuller Center’s interviews with those quoted for this story in the audio links below. Thank you all for giving your time and your heart and doing Gods work~~. I have no words & there is no works I can say to help you understand the blessing you have giving my family ❤. My father Tim Bennett is the best man I have ever know! He raised me & my older sister Candus Bennett by him self & working. He is not the kind if man to ever ask for anything❤.. All I can say is THANK YOU TO everyone who gave there time that they didn’t have to & to anyone who had a hand in this blessg!! THANK YOU, THANK YOU, HANK YOU!!! !